Wow! Can you believe we are half way through July already?? Why is it that our favorite season of the year seems to fly by? I don’t know about you, but I absolutely love the warm weather months. It is so good to be outside again! I take a two mile walk every morning and then I don’t feel so guilty about sitting most of the day working in front of a computer. Then when I get home in the evening, I can just do some simple floor exercises or lift some weights and I am finished! I have been on vacation with my grandchildren and had a lovely time. I adore being a grandmother! Hopefully I can sneak in a long weekend where I can just do whatever I feel like doing as well. Please remember the homeless and disenfranchised of the world. They suffer in the summer as well as the winter. Please do what you can to help them and each other. Our world is full of turmoil at the moment and it is both sad and frightening. Please do your part to be the change you would like to see. 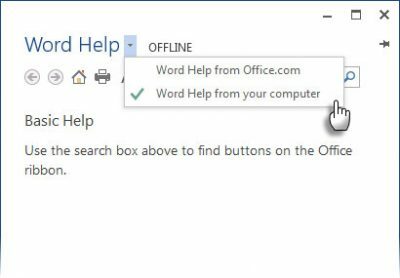 Word assumes, by default, that you want online help when you have a problem with your document. Although the online Help resource is way broader in scope than compared to the local Help, that can very well turn out to be a hindrance when you are not online or if you have a slow Internet connection. So luckily you can force Word to display the offline basic Help files that are store in your computer using a simple switch. Click F1 to display the Help screen. Click the drop-down arrow next to Word Help. Select Word Help from computer. Note that you can always pin the Help screen to the top of your document and continue working while looking at the instructions on the Help screen. It’s always good to have choices, right? 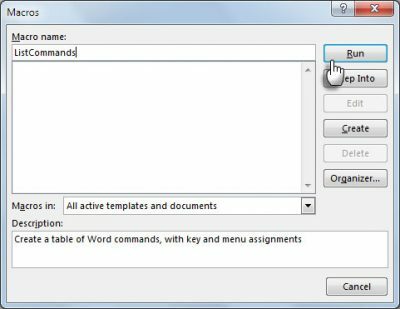 This article will tell you how to find this obscure list and how it will create a new Word document with a full list of all of Word’s commands. You can save this document and search through it at your leisure to understand the use of the commands you never knew existed. 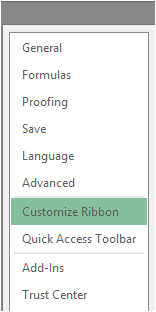 Click on File | Options | Customize Ribbon. Under the Main Tabs list, check Developer to show it on your Ribbon. Now go to Ribbon | Developer | Code Group | Macros. In the Macro dialog box type, key in ListCommands. Click Run. This will make the List Commands dialog box disappear. To list all commands, click All word commands. Word will create a new document with all commands laid out in a table for you. You can go through the list and see the commands and see what they do or you can check for commands that were in previous versions of Word. The entire list is searchable. What are some of your favorite commands or shortcuts? I’d love to hear from you! Subscribers: Having A Problem with word? Open it in Safe Mode! Most folks don’t even know that there is a Safe Mode option in Microsoft Office. I have to tell you that until very recently, neither did I! Now that I am aware of this handy little “hack,” I find it extremely useful. I mostly use it when I want to take screenshots for a tutorial showing the default Word, rather than my customized screen. But you can also use it when you are having a problem. It will disable add-ins that are acting erratically. You can also use Safe Mode to suppress any customization you have made to your version of Word. Depress and hold down your CTRL key and start Word by double-clicking the button for the program. Keep your CTRL key depressed until the Safe Mode dialog box appears on your screen. To exit Safe Mode, Close Word and then re-open it as you normally would. I think you are going to be very happy you learned about this! The Developer tab includes tools to import ActiveX Controls and VBA files in Excel. 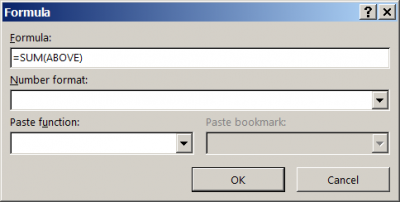 Select Customize Quick Access Toolbar (QAT). 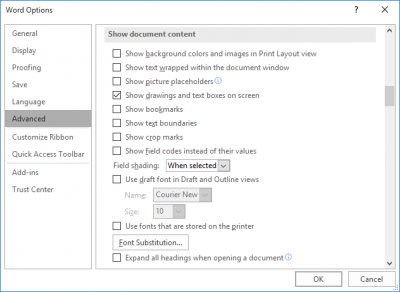 Subscribers: Why Won’t My Pictures Show In My Word Document??? There are numerous reasons and solutions as to why your pictures may or may not show up in Word even though you know you have added them. I will not go into all the specifics in that regard in this article. Click on File | Options. Click Advanced at the left-hand side of your screen. Scroll until you see the Show document Content section. Note the Show Picture Placeholders check box. This is what controls whether Word will display any drawings, regardless of where they reside in Word. If it is selected, then Word will show a placeholder for the graphic but not the graphic itself. So, is you want to see your graphic, deselect this setting. Note also the Show Drawings and Text Boxes On Screen check box. This is what controls whether or not drawings are displayed when using Print Layout and Web Layout views. Change it to suit your purposes. When you are finished, click OK to close the dialog box. Hopefully this will resolve your issues with images appearing in your documents! I use tables in Word quite a lot and most of the time I am using a column just for pricing or costs or something to do with money. Luckily, Word will allow me to do simple calculations on tabular data like I do in Excel. To do this, I must use equation fields. Suppose I have thirty row table and I wanted to total the values in the last column. Go ahead and set up a table of any size and throw some figures in the last column so you can do this with me. Place your cursor in the cell in which you would like the total of your data to appear. For our purposes that would be in the last cell of the last column. 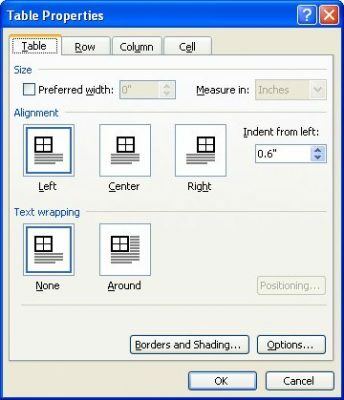 Display the Layout tab on your Ribbon under Table Tools. 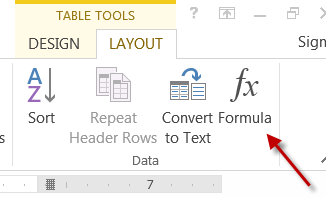 In the Data group, click the Formula tab to display the dialog box. Using the Number Format drop-down list, select how you would like your number to be formatted. Once the sum is placed in the cell and you later change the column data, remove or add rows, you will have to update the sum. You can do this my selecting the field and clicking F9. In just about every law office that has employed me the lawyers wanted tabs in their footnotes. I have to agree that it is much more pleasing to the eye and easier to follow the text when you indent with a tab. Unfortunately, Word does not allow you to do this automatically. Actually, it does not allow you to specify which character you want to appear between your footnote reference number and the footnote text, like you can with a numbered list Rather, Word places a space between them. There are more than one method you can use to make sure your footnote includes a tab separator. All methods though, assume that you have the Footnote Text style set up to handle the tab properly. You see, whenever you insert a footnote in your document, Word will format the footnote so that it uses the default Footnote Text style. You can control how your footnote appears by making changes to the built-in style. If you want a tab character between the footnote reference number and the beginning of your footnote text, then you need to set a tab stop in the Footnote Text style so Word know what to do with the tab character you put in your footnote. 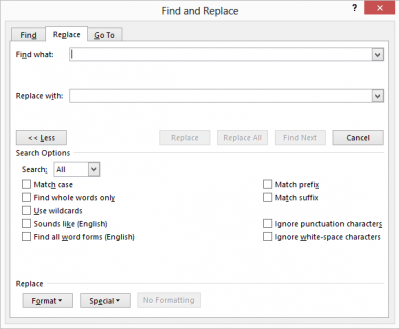 Click CTRL + H to display the Replace tab of the Find and Replace dialog. If it is available, click on the More button. Be certain Use Wildcards is selected. In the Find What area, key in (^2). Note there is a space after the last parentheses. With your cursor still in the Find area, click on the format button and select Style to display the dialog box. In the list of styles there, select Footnote Text style. In the Replace With area, key in \1^t. When you are finished, all of your footnotes will have the tab between your footnote reference number and the start of your footnote text. I don’t know about you, but lots of times when I am working in a Table in Word, I need to select a range of cells. It is easy to do, just using your mouse or your keyboard, or a combination of both. Of course the first step to select a range of cells is to put your cursor in the first cell of the range you want to select. Go ahead and do that. Using your keyboard, hold depress and hold your Shift key as you use your arrows (navigation keys) (up, down, left right). to extend the range of your choosing. Using your mouse, you can click on the first cell and hold down your mouse button as you drag to extend the range of your choosing. Using your keyboard and your mouse, you can depress and hold down your Shift key as you click on the cell that defines the opposite corner of the range of your choice that you want selected. Once you have set up a table in your document, you cannot utilize the normal formatting tools to indent your table, as you would in a regular document. The reason for this is that usually your tables do not behave as paragraphs do. There is more than one way in which you can indent your tables. 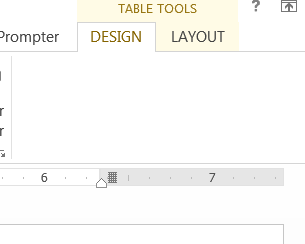 One way is to drag your table to an indented position in your document. All you really have to do is use your mouse to move the indent marker for your table. This is the marker directly above the far left edge of your table. When you move this marker, Word will move your entire table in the direction you move the marker. Place your cursor someplace within your table. 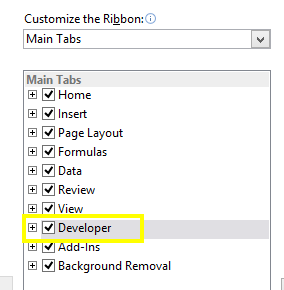 Be certain the Layout tab of your Ribbon has been displayed. Remember, this tab is only available if your cursor is inside a table. In the Table group, click the Properties tool, to display the dialog box. Be certain the Table tab is selected. Using the Indent From Left tool, specify how much of an indent you would like to use for your table.